The week started out pretty rough around here. After weeks of math, karate, science and art camps--all separately--the boys had their first day at summer camp together on Monday. It's not as though they have not seen each other all summer--there was no sleep away time, so they had afternoons, evenings, and weekends. But these boys mix like oil and water sometimes. Repeatedly, in different childcare settings, we have had to take pains to arrange separation for them. They are both high-energy kids, and while Barley is the more stubborn and more aggressive of the two--Teddy gets his licks in and digs in his heels also. Apparently on Monday, they both forgot how to be nice to each other. From the report DH got, they were fighting like cats and dogs from the minute they were dropped off, to the end of the day when they got picked up. The camp is not a large one--maybe a dozen children? So everyone tends to stay together as a group. And since both boys gravitate toward the same games and same playmates, there was plenty of opportunity for escalation and high emotion. Of course, both children could recite acts of aggression and escalation by the other. We heard that Barley did try to use his words, but when he still didn't get what he wanted, he resorted to physicality, as is his habit. The end of the day found Teddy indoors, hiding and crying, and Barley outside, angry and also upset at the breakdown in their relationship. They were best enemies, not best friends. I have a crazy busy work week, so I didn't hear any of this until I opened the office door and exited my cave of concentration to an eerily quiet house. The boys had each retreated to separate floors, and DH was making dinner. TV and video games had been temporarily banned, and we were waiting for the tides of emotion to ebb enough to have a calm discussion. The boys had already been notified that their video game privileges would be suspended the next day. Barley pointed out that the only time they weren't fighting that day was when they had the video games, so that was only going to make it harder for them to get along! We would have to see. Barley surprised us all by being the first to approach his brother, and apologize--UNPROMPTED . Although he had been angry at their last conflict, he did also feel terrible about the fact that they had not gotten along all day. This act of contrition on his part made me VERY hopeful that all the hard work we are doing with anger management may just be having some tiny effect after all. This scene on the stairway banister made me even more hopeful. After Barley's apology, he suggested this as an activity for them both to work on. Teddy agreed, and this tableau was lined up before dinner was even on the table. It is still there 2 days later. After dinner that night, we had a quiet evening--still no TV or video games. Barley was waiting impatiently for a comic book he had been reading, but which Teddy had picked up when Barley put it down. We sensed another volcanic eruption on the way, and encouraged Barley to go find another book to read while he was waiting. Once in the other room, he got distracted by the piano instead. He started experimenting, and calling to us to listen to the songs he made up. 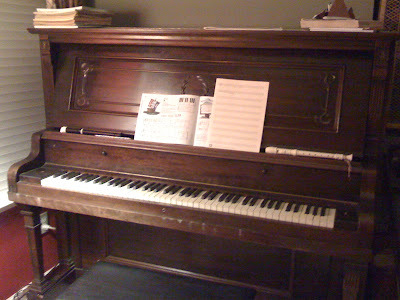 I sent DH in with music paper to memorialize the music Barley was creating. This distracted him from being ticked off at his brother, and the rest of the night went peacefully. Bedtime was pretty subdued. Since Teddy is getting over being sick, I think maybe that contributed to his inability to get along with his brother at summer camp that day. After they went to bed, I pulled out some presents I had bought the boys for back to school. It is a few weeks early, but I wanted to give them something to help create some space away from each other the next day. Without their video games to escape into, I worried they would just have another day of conflict and upset. 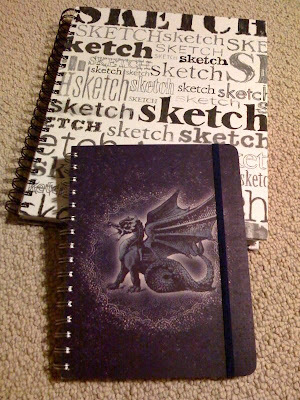 Teddy loves to write stories, so I had gotten him this cool dragon-covered journal. He's been writing in composition notebooks, but he keeps losing them around the house. I am hoping he will keep better track of this one. Barley loves to draw dragons and other pictures, so his larger book is full of high quality art paper. The pages are perforated, so he can take them out to share, or keep them organized in the book. I was not there when they were presented in the morning. DH reported that Teddy's eyes lit up, and he was on board instantly! Barley was disappointed that it wasn't a video game, but allowed himself to be sold on the quality of the paper and the larger pages to draw on. They were encouraged to "escape" into writing or drawing if they started arguing again at camp. I worried about them all day yesterday, and asked for a report when I got home Tuesday night. I was shown this by the boys in response to my question about how the day had gone. The boys decided to collaborate on a story. Teddy wrote chapter 1, and Barley illustrated it. Instead of using these new books as a way to escape each other, they used them to spend constructive, creative time together. I L*O*V*E THESE BOYS! They are TOTALLY AWESOME. Especially when they remember how much they love each other. See, this is why I love the procees you're going through blogging. I knew something important had happened over the last couple days, but it took reading it as you've laid it out to really get it. The last line is the key, from my perspective. Remembering love, they'll get through the worst they can each throw at the other. Sometimes, sweet times like this one, they can even remember without our having to remind them. There were always times that Jack and I "hated" each other and even resorted to physical means of settling our arguments...which I always won until he was about 15..then I say we went 50/50. As you know, these days we are closer then any two guys should be, and bonus WE'RE BOTHERS. From being in their situation, I can honestly say there will be nothing more memorable then these fights, and nothing more bonding then how we resolved them. Our wives' running joke is that Jack and I will never live more than a stone's throw apart. I can see the pride in my parents eyes when Jack and I collaborate on something or just act like brothers. No one in this world, parents included, have the free reign my brother does to put me in my place, and vice-versa. Hearing how proud you are makes me a tiny bit sad that I can't see it with my own eyes. Its nice to read though. I think the biggest thing that I saw this week was Barley owning his relationship with his brother. That was a HUGE step for him, and not one I have seen him take before. DH and I usually try to mediate between them, because frankly, Barley's methods of dealing with conflict have always generated MORE conflict. This time, the emotional upset was SO huge, that it seemed too devastating for immediate discussion. The forest fire had to burn itself out on its own. Seeing Barley take the first step to healing was a major milestone. We just watched the first green shoots rising out of the ashes of the forest fire and held our breath that they would keep on growing.